The Lord's Mail (also called the Armor of Morihaus or the Gift of Kynareth) is an artifact given to mortals by Kynareth, one of the Eight Divines. 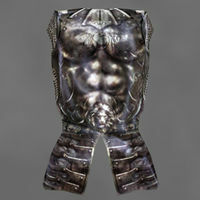 It is an ancient plated mithril or ebony cuirass of unsurpassable quality, considered to be heavy armor. It grants the wearer the power to absorb or regenerate health, resist the effects of spells, and resist or even cure poison. It is said that whenever Kynareth deigns the wearer unworthy, the Lord's Mail will be taken away and hidden for the next chosen one. The Mail was originally owned during the Merethic Era by the bull Morihaus, a demiprince and early cultural hero of the Cyro-Nordics who was closely associated with Kynareth and the Lord. The cuirass is sacred to the Imperial Legion and the Imperial Cult, and is accepted as uniform in the Legion. Indeed, the armor has been known to bear the red dragon sigil of the Third Empire on its breastplate. The cuirass was uncovered by the Eternal Champion during the Imperial Simulacrum in either Skyrim or Black Marsh (accounts vary). In the events leading up to the Warp in the West, a clue to the artifact's location was discovered by a witch living in the Iliac Bay region. In return for kidnapping the witch's great-granddaughter to become the witch's successor, she revealed the clue to a questing member of a knightly order, who retrieved it from the dungeon where it lay. Later in the Third Era, the Mail came into the possession of the Imperial Legion. It was stored in a shrine in Castle Ebonheart, the seat of Imperial authority on Vvardenfell. In 3E 427, the cuirass was stolen by Furius Acilius, a member of the Legion, who then deserted and fled into the underground cave network beneath Ebonheart. A Knight Protector of the Legion recovered the cuirass and gave it to Varus Vantinius, the Knight of the Imperial Dragon on Vvardenfell. The Knight Protector later challenged Vantinius for the title of Knight of the Imperial Dragon; the two dueled in the arena of Vivec, and Vantinius was slain. The victor then claimed the Lord's Mail. Later that year, the cuirass was sold to Torasa Aram, who put it on display in her Museum of Artifacts in Mournhold. On the 15th of Last Seed, 4E 201, Emperor Titus Mede II wrote a formal request to General Tullius, the Military Governor of Skyrim, ordering that Imperial relics be placed back into the service of the Empire in order to galvanize the Imperial Legion's cause during the ongoing Stormcloak Rebellion. The Emperor singled out the Lord's Mail, which had recently gone missing, and ordered that it be reclaimed by the Legion in order to demonstrate that Kynareth favored the Empire. The armor had been stolen by a group of Alik'r mercenaries who sought to sell it to the highest bidder and discredit the Empire. However, the armor at this time bore a curse which would cause any who wore it to be overcome with an uneasy fatigue. The Last Dragonborn learned of the Emperor's orders and intercepted the mercenaries at their camp on the plains of Whiterun Hold, south of Fort Greymoor. The Lord's Mail was then brought to the Shrine of Kynareth at Solitude's Temple of the Divines and cleansed of its curse. This page was last modified on 9 January 2019, at 03:31.